He said, “For whoever is ashamed of Me and My words, of him the Son of Man will be ashamed when He comes in His own glory, and in His Father’s, and of the holy angels” (Luke 9:26). We, who are Christians, are not ashamed of Jesus’ words. Despite what the world thinks of us, we will confess Jesus Christ. Jesus said, “Therefore whoever confesses Me before men, him I will also confess before My Father who is in heaven. But whoever denies Me before men, him I will also deny before My Father who is in heaven” (Matt. 10:32-33). “But from the beginning of the creation, God ‘made them male and female.’ ‘For this reason a man shall leave his father and mother and be joined to his wife, and the two shall become one flesh’; so then they are no longer two, but one flesh. Therefore what God has joined together, let not man separate” (Mark 10:6-9, cf. Gen. 1:27, 2:23). 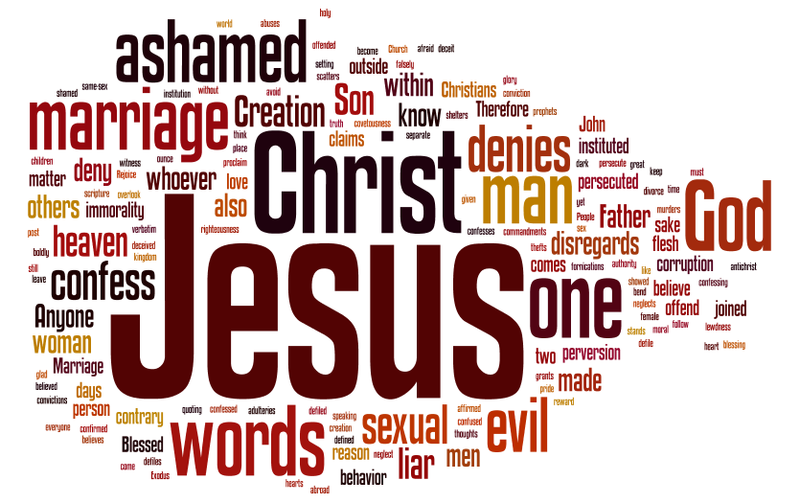 Anyone who neglects these words of Jesus denies Jesus Christ. Marriage is an institution made by God and defined by Christ. Anyone, who claims to follow Jesus and yet disregards the verbatim and literal 6 days of Creation in Genesis and Exodus, disregards the words of Jesus Christ. Don’t be confused or deceived. People, who deny Jesus, are defiled by evil. Their hearts are dark and corruption is within. “Blessed are those who are persecuted for righteousness’ sake, For theirs is the kingdom of heaven. Blessed are you when they revile and persecute you, and say all kinds of evil against you falsely for My sake. Rejoice and be exceedingly glad, for great is your reward in heaven, for so they persecuted the prophets who were before you” (Matt. 5:10-12). Anyone who claims to know God and denies him is a liar and an anti-Christ. By the Spirit of Christ, the Apostle John stated, “He who believes in the Son of God has the witness in himself; he who does not believe God has made Him a liar, because he has not believed the testimony that God has given of His Son” (1 John 5:10). John also said, “Who is a liar but he who denies that Jesus is the Christ? He is antichrist who denies the Father and the Son” (1 John 2:22). Liars will say that they know Jesus, but “He who says, ‘I know Him,’ and does not keep His commandments, is a liar, and the truth is not in him” (1 John 2:4). “He who is not with Me is against Me, and he who does not gather with Me scatters abroad” (Matt. 12:30).